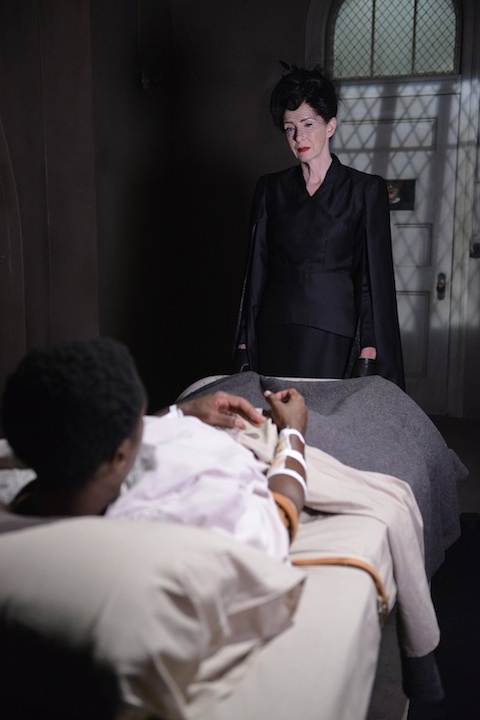 Among the stars of the first season of American Horror Story who were on board to return for Season 2's Asylum is Frances Conroy, who played the older version of the house maid Moira O'Hara in Season 1 and has yet to appear in American Horror Story: Asylum, but we'll see her in this week's episode. Check out this first look photo as Conroy in her new role. Like every other actor who's returned to American Horror Story for the series' second season, Conroy will play a brand new role in Season 2. Details on her character are vague at this point, but from what TVLine says, Ryan Murphy previously stated that Conroy's Asylum character is "the ultimate angel." You'd think that'd be a good thing, but it's hinted that her appearance at Briarcliff may not be a good thing. The log line for the episode refers to her as a "dark angel" and apparently Sister Mary Eunice is "petrified" of her. Here's the photo the site shared, which shows Conroy dressed in black. She looks ready for a funeral. Or I'm still associating her with her role from Six Feet Under. Speaking of which, her return to American Horror Story reunites her with James Cromwell, who's new to the FX series this season, but played the role of Conroy's character's second husband George in the later part of the HBO drama. We'll have to wait and see if their paths cross when her "dark angel" character arrives at the institution. American Horror Story: Asylum's "Dark Cousin" episode airs this Wednesday (November 28) at 10:00 p.m. ET on FX.